The Society’s longevity over 150 years is due to its members’ continuing interest in the natural world - its flora, fauna and geology. A key activity for the Society is to enthuse the public’s awareness of, and commitment to, local wildlife and its environment. Changes in recent times have presented new opportunities and challenges. Greater public mobility and improved access to sites of interest, new means of communication and recording, and competing attractions and environmental changes have all shaped our direction and priorities. The Society’s response and achievements in recent times can be represented by three interlocking themes – Discovery, Conservation and Engagement. Here are some highlights reflecting this. A varied programme of Field Meetings, mainly during the more clement months, has been a continuing achievement. These outings, as well as being social events, have introduced members to new sites and where expertise is willingly shared. Most venues are around Cardiff or within easy reach, mixed with some excursions further afield, which were especially popular when organised as coach trips. Long weekends have been enjoyed in Pembrokeshire, S. Devon and the Peak District and, more adventurously, a week in the south of France. 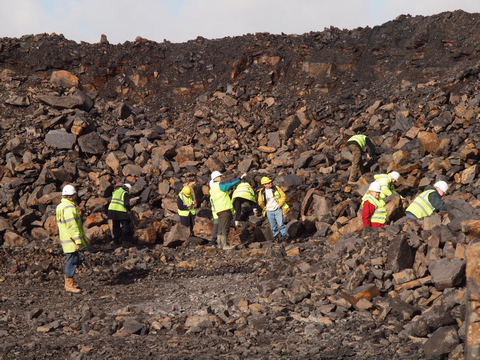 Geological sites explored range from the exposed formations and fossils of the Glamorgan Heritage Coast to nationally important reserves in the Brecon Beacons, Dan yr Ogof Caves and even to a working opencast site. The coast has also featured in seashore “rockpool rambles” carefully timed to coincide with low tide conditions. Other general interests have been catered for, including visits to the National Botanic Garden of Wales during and after its construction, and to a number of arboretums or parks with important tree collections. Less conventional have been excursions to the Victorian Festival in Llandrindod Wells, the Army ranges near Sennybridge, ending with lunch in the officers’ mess after a very wet morning, and to the Cardiff Weather Centre. In the past the Society has financed and carried out exploratory archaeological work and conducted historical research. This aspect was reflected in visits to Caerwent, Hereford (Mappa Mundi) and Raglan and Kidwelly Castles, and in Hampshire, Butser Ancient Farm and Gilbert White’s Selbourne. 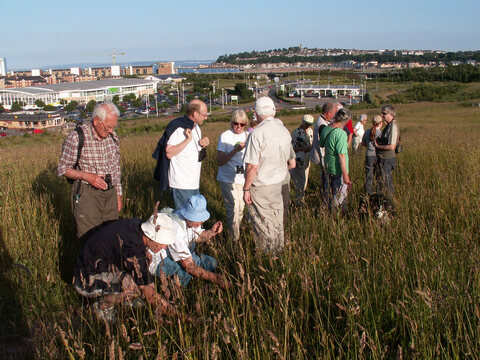 The Society has contributed to the annual Cardiff Wildlife Weeks by conducting public walks. These have been generally well-attended and show people aspects of their local environment that they are often unaware of – as well as attracting new members. Within the Coryton Roundabout is a mix of woodland, flowery grassland and scrub. 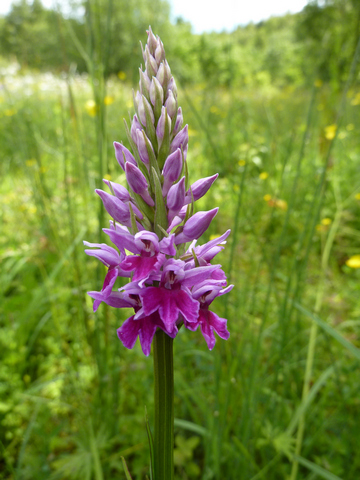 During public walks around the site led by the Society an unusual deep-purple form of the Common Spotted Orchid (Dactylorhiza fuchsii var. rhodochila) was found. 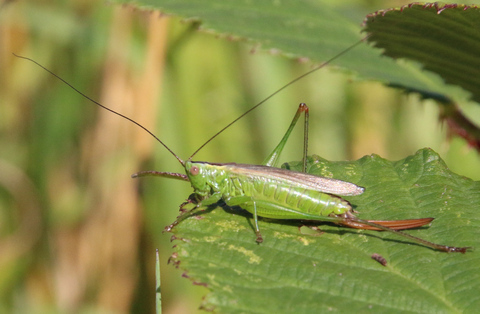 On another occasion, a species of bush-cricket, a Long-winged Conehead, was spotted, a first for Wales. Two colour-illustrated booklets with member’s photographs and artwork were published in the early 1990’s describing a dozen wildlife walks in and around Cardiff. The contents remain relevant today. Complementary to the outdoor events, a programme of indoor meetings brings members together over the winter months. At many of these, presentations have been delivered by individual members themselves, covering a variety of topics from their special floral or faunal interest to holiday explorations. Members’ Evenings offer the opportunity for several shorter presentations in one evening. Cardiff University’s academic expertise and research has been drawn on to deliver insights into, for example, the potential effect of climate change on birds, insect parasitoids, and DNA of primates. Other guest presenters brought live specimens with them and there have been memorable close encounters with snakes, owls, a hedgehog (in care) and a (stuffed) otter. 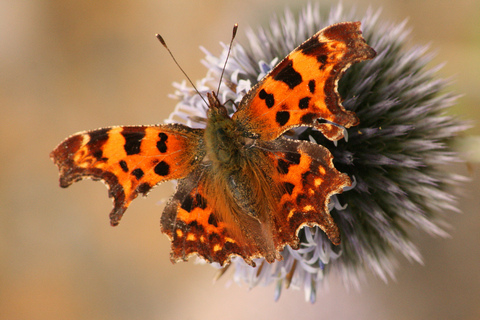 The Society representation on Cardiff’s Local Biodiversity Partnership provided valuable contributions in the development and implementation of Cardiff’s Biodiversity Action Plan “Wild About Cardiff”. This in turn informs the authority’s Local Development Plan, a major strategic document which sets out policies relating to land use and designates areas for housing and business development, with due consideration of their impacts on the environment including biodiversity. Our members often have specific detailed knowledge relating to the wildlife interest of local sites. This provides a valuable basis for commenting on the potential impact, whether positive or negative, of individual Planning Applications and any appropriate safeguards or measures that may be required. The Cardiff Bay Barrage presented a dilemma for the Society in offering new opportunities for wildlife in the region while removing the protection and causing the destruction of a statutory designated site (SSSI) within the City. The Society was able to add its weight to the proposals for the compensation arrangements which ensued. The Society also provided expertise to the group developing the wide-ranging Severn Estuary Strategy in the late 1990s. Dr Mary Gillham MBE was a prominent member of the Society throughout her time in Cardiff, initially as a lecturer at Cardiff University. 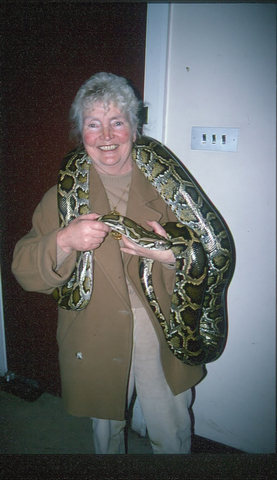 An eminent and well-travelled naturalist, she held most of the major posts within the Society including President and enthused and encouraged many past and current members. She had an unrivalled reputation as a leading field naturalist in the region as well to being a prolific author, writer and illustrator. Her series of five books on the varied habitats of the Glamorgan Heritage Coast are unparalleled. More recently she published three books covering the capital city’s wildlife and landscape (and some history), focussed on the Taff and Rhymney river systems and the countryside around her home near the Garth. A current Heritage Lottery funded project aims to conserve her archive of documents, photographs and artwork in digital form and capture the scientific data within them. The Society has taken advantage of developments in digital technology and social media to broaden its exposure with its website , blog , Twitter feed and Facebook page . Email is used for member communication, and digital projection at indoor meetings enables presenters to deliver photos, video and text in more imaginative ways. The Society’s periodical newsletter keeps members up to date about forthcoming events and contains reports of recent ones and other contributions, all illustrated in colour. An annual weather report continues a tradition first started in the early years of the Society. There are many competing interests, attractions and activities on offer today and the Society has not been able to maintain the extraordinary level of membership of its early years. It has always had a wide remit that now overlaps with many single interest groups. Collaboration and partnership has been adopted to extend the Society’s reach. Currently there are some regular joint meetings, indoors and out, with the Cardiff Group of the Wildlife Trust of South and West Wales and Cardiff University’s student Wildsoc which have been appreciated by all parties. Similarly fungus forays have been conducted with the Glamorgan Fungus Group and birdwatching with Cardiff’s RSPB group. In 2002 The Society gained charitable status and updated its constitution to confirm the relevance and validity of its objectives.